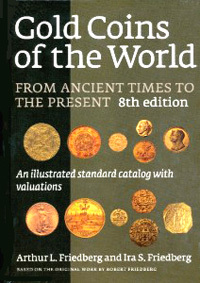 Actual size of book - H 11 3/4" x W 8 1/4"
From Ancient times to the present this fully illustrated standard catalog is complete with valuations and illustrations. The "preface" of the book is written in English, French, German, Italian and Spanish. 800 pages, completely revised and updated. More than 8,000 photos, over 1,000 of them new. 21,000+ listings of coin types, with sections expanded and many new discoveries. From the 6th century B.C. to date—over 2,500 years of gold coinage from ancient Greece to modern Zambia. The universally-used Friedberg™ Numbering System: The world's standard method of cataloging, describing, buying and selling gold coins. Contemporary (post-1950) coinage now integrated in alphabetical order with all other issues. Tables of weight and fineness with each country. Market valuations in two states of preservation. A directory of the world's leading gold coin dealers. Unsurpassed in content and scope. A must for every collector, dealer and library. Coinage of the Greeks [Paperback] Stillman, N. J.